As Autumn is fast approaching you will see flower beds being emptied for the winter bedding and the soil being improved. All along Park Road the circles will be planted up as well as the Sapcote sign on the corner of Park Road. The entrance to Donkey Lane will be brightened up with the ongoing flow of all the planters being finally planted up with Pansies, Viola’s all around our village. So as you can imagine we need more volunteers, especially helping with the planting and the watering through the summer months…. We have a list of areas that we would like to focus on but would love it if there are residents that could take on some watering and just keep an eye on them. The grass area near Compton Lodge would look lovely with a planter as it is a entrance our village and would look fabulous planted up - there are always areas we would love to develop but can’t without your help. There will also be a mass Bulb planting day at the end of September which we need volunteers for. So if you can spare a couple of hours please don’t hesitate to come along and make YOUR VILLAGE look brighter through the darker months. You may have noticed that there has been a lick of paint added to the bench on Park Road opposite the Sapcote Sign. Thank you very much Sid who managed to do this on his mobility scooter. So please don’t be put off that you can’t do things to help…. Come along and join us bunch of amateurs and make new friends. Sapcote should also be getting some new benches from the Parish Council that will be placed around the village so you can take in your surrounding area and ponder your thoughts. If you are not green fingered you could perhaps paint some of the wooden planters there is always a warm welcome that awaits you or bake a cake for our fund raising events or attend and help at our events. You will also have noticed that the library has been planted up and looks a lovely focal point by Sapcote Community library. Sapcote Bloom Group has now relinquished its responsibility and handed full control over to the library. So a big shout out to the library for all your hard work we look forward to seeing your displays which will enhance our village in the future. We are going to be planting some planters up along the Church wall and have a volunteer to who is willing to take them on. ​We are also looking as putting a display outside the CO-OP near the corner of the Old School so once again would anyone like to take that watering on - We do have Aqua Trollies which make the job easier. We will be taking the Cordylines out of the Grace Road planters for they have out grown there purpose there and will be replanted hopefully opposite the Club which will be having a makeover soon so there is lots going on and many hands make light work. I think you will all agree that the village looked fabulous over the winter months with all the winter bedding and they definitely brightened the village up. ​Planting has begun and the Sapcote sign has been completed also the entrance to Penfold Close, Liversey Drive the circular beds on Park Road and Donkey Lane all looking ready to flourish. Please feel free to send photographs to me and I will upload them onto here - Lets be proud of our village. I will be adding photographs through the summer as our planters get established. We also held a Vintage Tea Party at the pavilion in May and had plants, raffle, bric-a-brac, book stall and lots of cakes for sale. 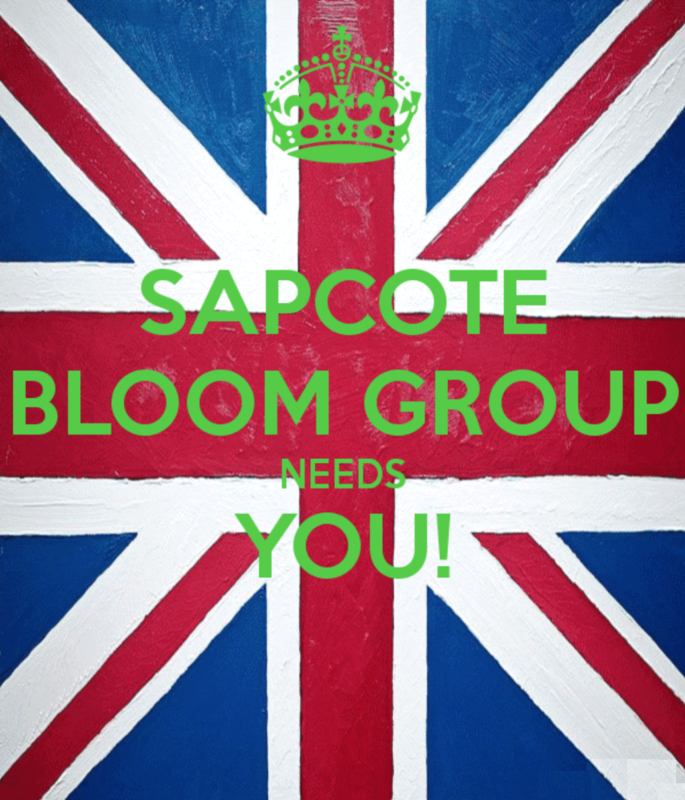 We want to raise awareness of what SAPCOTE BLOOM GROUP is all about and spread the word. If you know of anyone who would like to volunteer whether it be watering the planters, helping with our fundraising give us a call, message and any help would be gladly appreciated. ​If anyone would like to adopt a spot around the village in memory of a loved one or just to look after a spot if does make a difference and puts a smile on your face. We have planted 10000 native snowdrop bulbs all around Sapcote. ​These will flower in early spring 2015 so keep an eye out for those. The open garden events at Dairy Cottage in May & July were very successful. The Sapcote Bloom Group hosted the refreshments for both of the events. A big Thank you to Nora for allowing us to take over her house on these days! Thanks to everyone who helped put the event on and also those who came along and supported the event and ate all the cakes and drank tea!